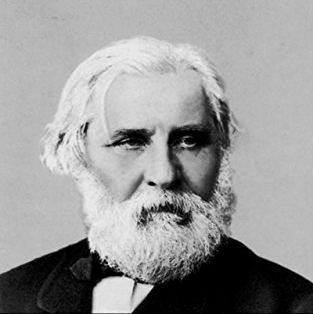 ABOUT THE AUTHOR: Ivan Sergeyevich Turgenev (1818-1883) was a Russian novelist, short story writer, poet, playwright, translator, popularizer of Russian literature in the West. His first major publication, a short story collection entitled A Sportsman's Sketches (1852), was a milestone of Russian Realism, and his novel Fathers and Sons (1862) is regarded as one of the major works of 19th-century fiction. ‘It’s very simple. I was eighteen when I had my first flirtation with a charming young lady, but I courted her just as though it were nothing new to me; just as I courted others later on. To speak accurately, the first and last time I was in love was with my nurse when I was six years old; but that’s in the remote past. ‘Then how’s it to be?’ began the master of the house. ‘There was nothing much of interest about my first love either; I never fell in love with any one till I met Anna Nikolaevna, now my wife — and everything went as smoothly as possible with us; our parents arranged the match, we were very soon in love with each other, and got married without loss of time. ‘My first love, certainly, was not quite an ordinary one,’ responded, with some reluctance, Vladimir Petrovitch, a man of 40, with black hair turning grey. His friends at first would not agree, but Vladimir Petrovitch insisted on his own way. A fortnight later they were together again, and Vladimir Petrovitch kept his word. I was sixteen then. It happened in the summer of 1833. I lived in Moscow with my parents. They had taken a country house for the summer near the Kalouga gate, facing the Neskutchny gardens. I was preparing for the university, but did not work much and was in no hurry. No one interfered with my freedom. I did what I liked, especially after parting with my last tutor, a Frenchman who had never been able to get used to the idea that he had fallen ‘like a bomb’ (comme une bombe) into Russia, and would lie sluggishly in bed with an expression of exasperation on his face for days together. My father treated me with careless kindness; my mother scarcely noticed me, though she had no children except me; other cares completely absorbed her. My father, a man still young and very handsome, had married her from mercenary considerations; she was ten years older than he. My mother led a melancholy life; she was for ever agitated, jealous and angry, but not in my father’s presence; she was very much afraid of him, and he was severe, cold, and distant in his behaviour. . . . I have never seen a man more elaborately serene, self-confident, and commanding. I shall never forget the first weeks I spent at the country house. The weather was magnificent; we left town on the 9th of May, on St. Nicholas’s day. I used to walk about in our garden, in the Neskutchny gardens, and beyond the town gates; I would take some book with me — Keidanov’s Course, for instance — but I rarely looked into it, and more often than anything declaimed verses aloud; I knew a great deal of poetry by heart; my blood was in a ferment and my heart ached — so sweetly and absurdly; I was all hope and anticipation, was a little frightened of something, and full of wonder at everything, and was on the tiptoe of expectation; my imagination played continually, fluttering rapidly about the same fancies, like martins about a bell-tower at dawn; I dreamed, was sad, even wept; but through the tears and through the sadness, inspired by a musical verse, or the beauty of evening, shot up like grass in spring the delicious sense of youth and effervescent life. I had a horse to ride; I used to saddle it myself and set off alone for long rides, break into a rapid gallop and fancy myself a knight at a tournament. How gaily the wind whistled in my ears! or turning my face towards the sky, I would absorb its shining radiance and blue into my soul, that opened wide to welcome it. I remember that at that time the image of woman, the vision of love, scarcely ever arose in definite shape in my brain; but in all I thought, in all I felt, lay hidden a half-conscious, shamefaced presentiment of something new, unutterably sweet, feminine. . . . This presentiment, this expectation, permeated my whole being; I breathed in it, it coursed through my veins with every drop of blood . . . it was destined to be soon fulfilled. The place, where we settled for the summer, consisted of a wooden manor-house with columns and two small lodges; in the lodge on the left there was a tiny factory for the manufacture of cheap wall-papers. . . . I had more than once strolled that way to look at about a dozen thin and dishevelled boys with greasy smocks and worn faces, who were perpetually jumping on to wooden levers, that pressed down the square blocks of the press, and so by the weight of their feeble bodies struck off the variegated patterns of the wall-papers. My father gave her a chilly glance; she was silent. Certainly the Princess Zasyekin could not be a rich woman; the lodge she had taken was so dilapidated and small and low-pitched that people, even moderately well-off in the world, would hardly have consented to occupy it. At the time, however, all this went in at one ear and out at the other. I was in the habit of wandering about our garden every evening on the look-out for rooks. I had long cherished a hatred for those wary, sly, and rapacious birds. On the day of which I have been speaking, I went as usual into the garden, and after patrolling all the walks without success (the rooks knew me, and merely cawed spasmodically at a distance), I chanced to go close to the low fence which separated our domain from the narrow strip of garden stretching beyond the lodge to the right, and belonging to it. I was walking along, my eyes on the ground. Suddenly I heard a voice; I looked across the fence, and was thunder-struck. . . . I was confronted with a curious spectacle. A few paces from me on the grass between the green raspberry bushes stood a tall slender girl in a striped pink dress, with a white kerchief on her head; four young men were close round her, and she was slapping them by turns on the forehead with those small grey flowers, the name of which I don’t know, though they are well known to children; the flowers form little bags, and burst open with a pop when you strike them against anything hard. The young men presented their foreheads so eagerly, and in the gestures of the girl (I saw her in profile), there was something so fascinating, imperious, caressing, mocking, and charming, that I almost cried out with admiration and delight, and would, I thought, have given everything in the world on the spot only to have had those exquisite fingers strike me on the forehead. My gun slipped on to the grass, I forgot everything, I devoured with my eyes the graceful shape and neck and lovely arms and the slightly disordered fair hair under the white kerchief, and the half-closed clever eye, and the eyelashes and the soft cheek beneath them. . . . I started, I was struck dumb. . . . Near me, the other side of the fence, stood a man with close-cropped black hair, looking ironically at me. At the same instant the girl too turned towards me. . . . I caught sight of big grey eyes in a bright mobile face, and the whole face suddenly quivered and laughed, there was a flash of white teeth, a droll lifting of the eyebrows. . . . I crimsoned, picked up my gun from the ground, and pursued by a musical but not ill-natured laugh, fled to my own room, flung myself on the bed, and hid my face in my hands. My heart was fairly leaping; I was greatly ashamed and overjoyed; I felt an excitement I had never known before. After a rest, I brushed my hair, washed, and went downstairs to tea. The image of the young girl floated before me, my heart was no longer leaping, but was full of a sort of sweet oppression. I was on the point of telling him all about it, but I checked myself, and merely smiled to myself. As I was going to bed, I rotated — I don’t know why — three times on one leg, pomaded my hair, got into bed, and slept like a top all night. Before morning I woke up for an instant, raised my head, looked round me in ecstasy, and fell asleep again. For the entire novella click here.